Dutch primatologist Marc Van Roosmalen of the national Amazon research institute has discovered four previously unknown types of monkey while combing the Amazon forests. 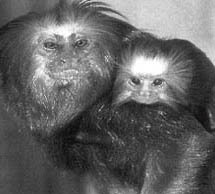 One of the new monkeys belongs to the callthrix genus and has been baptised "manicore marmoset" by the Dutch primatologist. The squirrel-sized manicore has a greyish white body with naked ears, orange legs, a black tail and a pinkish face. An average adult measures 22 cm with a 38-cm tail and weighs around 350 gm. Another is a member of Callicebus genus, known to the locals as "Zog-zog." It has a reddish-orange beard and belly, a greyish-brown back and a white spot on the tip of its tail. An average adult measure about 40 cm and weighs just over a kilogram. Scientists around the world are excited by these discoveries, remarkable even by Brazilian standards. With 80 of the world's 250 known monkey species -- more than any other country -- Brazil has turned up an average of one new monkey a year since 1990. Even more startling, the new species was found barely 300 km from Manaus, Amazon's largest city, 2,900 km from Rio de Janero. Enron Corp, the us-based power company, announced its purchase of ownership stakes in natural gas distribution in seven Brazilian states. With this move, the company has significantly expanded its role in Brazil's growing gas industry. Enron bought 41.5 per cent each of gas distribution in the states of Bahia, Alagoas, Sergipe, Pernambuco, and Paraiba, and 24.5 per cent each of the systems in the states of Santa Catarina and Parana. With these acquisitions, the company has now gained a seat in the five-member board of each distribution system, said Debbie Witmer, Enron spokesperson.